Perennial. Zone 2. Campanulaceae. European Alps. Syn. Campanula pusilla, C. bellardii, C. pumila. A.k.a. SPIRAL BELLFLOWER. Cochlearifolia is from the Latin cochlear, (from the Greek kochlarion), meaning “spoon”, in reference to the shape of the delicate, inwardly curved, mat-forming basal leaves. 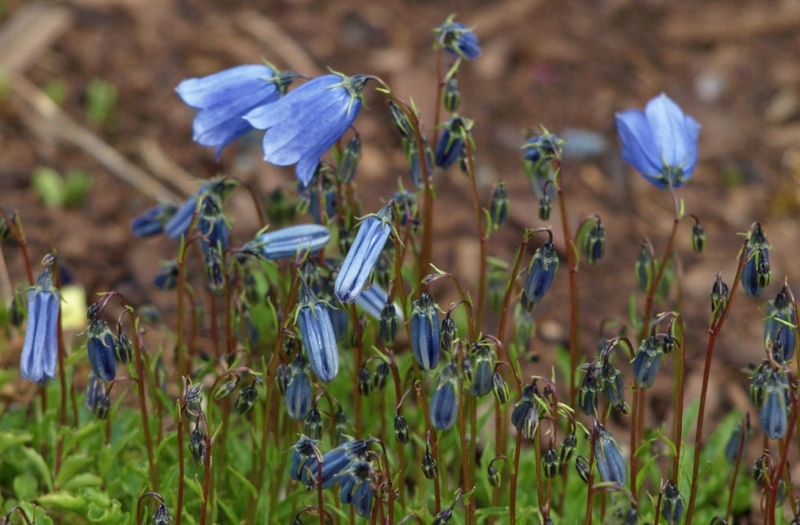 Probably the most popular of the alpine bluebells, and rightly so, for this wee plant is utterly adorable. Tiny, heart-shaped leaves arising from shallow-rooted, wiry rhizomes form an ever-expanding mat of foliage. From this arise numerous 2 to 3 inch stems topped by perfect, tiny, shyly nodding bellflowers from June until August, in varying shades of soft violet blue, and occasionally pure white. A number of named varieties of this little beauty are available, as well as the species type. All are excellent, though the “improved” varieties have unavoidably lost as bit of the charm of their petite ancestor, tending to have lusher, more upright foliage and a more “tuft-forming” habit. Newer cultivars ‘Bavarian Blue’ and ‘Bavarian White’ tend to be larger in all of their parts than the species, to 6 inches tall. You may also come across ‘Alpine Breeze’ (blue, very vigorous, with larger-than-the-species foliage), and the self-explanatory ‘Baby Blue’ and Baby White’. ‘Elizabeth Oliver’ is a beautiful pale blue double, first introduced in 1970. The species type in particular is fabulous anywhere a delicate groundcover is desired. Perfect over the smaller spring bulbs such as species crocus and tulips, as Campanula cochlearifolia is very shallowly rooted. Easily divided to spread it around; easily nipped back where not needed. Extremely pretty, and very hardy and adaptable. Sun to light shade, average conditions.